Hot on the wet heels of the recent discovery of blue pools on Mars comes images via Google Mars of what looks like a blue waterfall cascading over the edge of a Martian crater and down its sides. 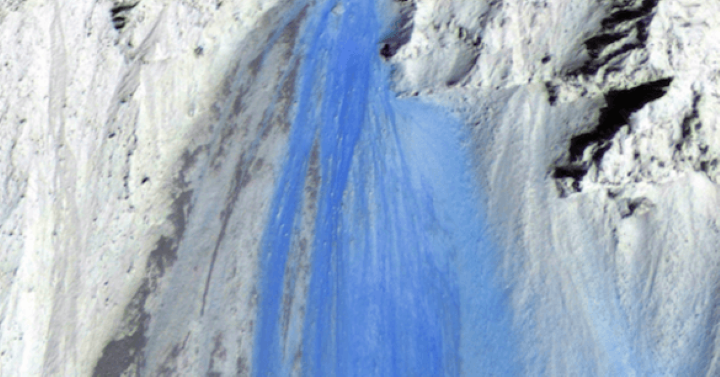 Before you say “it’s no Niagara,” it’s also not the first waterfall discovered on Mars, just the bluest. The waterfall was discovered by Argentine UFO researcher Marcelo Irazusta at the Google Mars coordinates: 7° 38’31.40″N 166°14’3.57″E. That location is the Zunil Crater, a 6.5 mile (10.4 km) wide crater named for a town in Guatemala. First spotted by the Viking 1 and Viking 2 Mars orbiters, the current images were taken by the Mars Global Surveyor’s Mars Orbiter Camera in 2000. Images resembling waterfalls have been found on Mars in the past. This image from the Mars Global Surveyor was discovered in 2003 before the advent of Google Mars. This image taken by the Mars Express in 2008 is of the Echus Chasma, a massive 100 km by 10 km area that appears to have been formed by either a waterfall or a lava flow or both, possibly forming the Kasei Valles. This 3-D enhanced image comes from a 2011 study which speculates that the water that may be flowing over these waterfall cliffs is a salty brine that warms quicker than pure water and could be thawing even in Mars’ freezing temperatures. What are we looking at in the image discovered by Marcelo Irazusta? Is it a true waterfall on Mars? A frozen one? Why is it blue? The “official” explanation for the recently-discovered blue pools is an optical illusion. Is it frozen brine? Something else? Yet another anomaly from the surface for the Red Planet. Google Mars is a great tool. Keep looking!